Before mentioning the fantastic range and different size of escutcheon we stock, we thought it would be helpful to those of you who have never heard of or used a keyhole escutcheon for us to detail its use first. Escutcheons are an item of door furniture which surround the keyhole or door lock providing a personalised and neat finish. For locking doors which have door handles with rose a separate escutcheon is usually fitted below the handle to hide the lock cylinder and any rough edges from where the cylinder is inserted into the door. Escutcheons also provide protection from damage and general wear from the end of the key when missing the keyhole and from the frequent turning action the door lock receives. All of our escutcheons come in matching pairs, one of which gets fitted to the front of the door and the other to the opposite side. Not only does this look good when matching your door handles but again covers the rough edges providing a neat finish on both sides of the door. 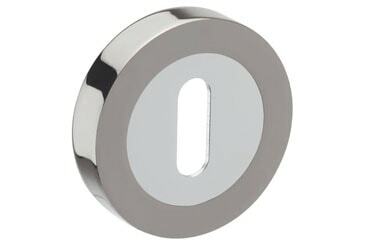 Our fantastic range includes square and circular standard keyhole escutcheons available in satin and polished stainless steel, chrome and even an inspiringly elaborate duo black nickel and chrome finish. 6mm, 8mm and 10mm escutcheon thickness’s with diameters from 50mm to 54mm depending on the area you wish to cover (please check individual product details for full information) all our escutcheons are concealed fixing meaning no screws will be visible. If you’re unsure of the type of escutcheon you should use on your door then please feel free to contact our friendly and knowledgeable staff who will be more than happy to help.